I’ve recently added blogging tags to my blog, courtesy of Userscripts.org and Greasemonkey for Firefox. Unfortunately, it (or the way I’ve put it in my template) appears to have a conflict with Flickr’s BlogThis feature, such that the image citations are hidden when the posting is viewed… not sure what’s causing it or how to fix yet. So, if you’re the owner of some flickr photo’s that I’ve blogged and wonder where the citations are, then I’m sorry, they get hidden as soon as I tag my post, and I’m working on how to restore them. In the mean-time, clicking the picture does still take viewers to your page, so they can view the actual owner details from there. 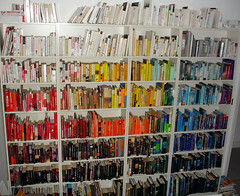 Wouldn’t it be nice to organise your books like this? Only, you’d have to have some sort of catalogue with the book’s colour to be able to find anything (probably use LibraryThing and add a colour tag). Flickr looks pretty cool. I’ve set up a profile in it: username sinewalker74 (which required a Yahoo! profile of the same name). So far, so good. I found out about it on the Blogger help pages. Apparently they work well together, so it should be a good place for putting baby photos in for family to see. But I couldn’t figure out how to make a link to the actual .JPG files in Flickr after you upload them. So things like my Blogger profile pic have to be stored on my ISP web site. Maybe I should look into fixing my ISP web site too.